It’s become far less common in recent years for voters to vote for one party for president and another for their local U.S. House seat. While the number of “crossover” districts did go up from 2012 — there are 35 of them, as opposed to 26 after the 2012 election — the percentage of crossover seats, just 8% of the 435 districts, is low historically. To put that in perspective, 40 years ago during the 1976 presidential election — a race that, like this one, saw a national popular vote difference between the two candidates of just about two percentage points — 28.5% of the seats (124 of 435) voted differently for president and for House. These crossover districts are important because they can be the best targets for the opposing party. If a party can win the district at the presidential level, it’s reasonable for that party to believe it can win the seat at the congressional level, too. But many of these 35 crossover districts may be more competitive on paper than in practice given that several have strong incumbents, and it’s also possible that their Hillary Clinton-Donald Trump vote is not really an accurate gauge of their true partisan lean. As we observed last week, there were significant changes in the presidential vote in nearly half of the nation’s congressional districts in 2016, but it’s unclear how much these changes will bleed down to House races. According to congressional-level presidential results calculated by Daily Kos Elections, Donald Trump carried 230 congressional districts while Hillary Clinton carried 205. That’s not a whole lot different than 2012, when Mitt Romney carried 224 districts to Barack Obama’s 211 under the current district lines. Of the 35 crossover seats, Clinton won 23 districts that a Republican House candidate won, while Trump won 12 districts that a Democratic House candidate won. Tables 1 and 2 show those districts. Let’s take a look at the incumbents in these 35 seats, whose names are bolded below. 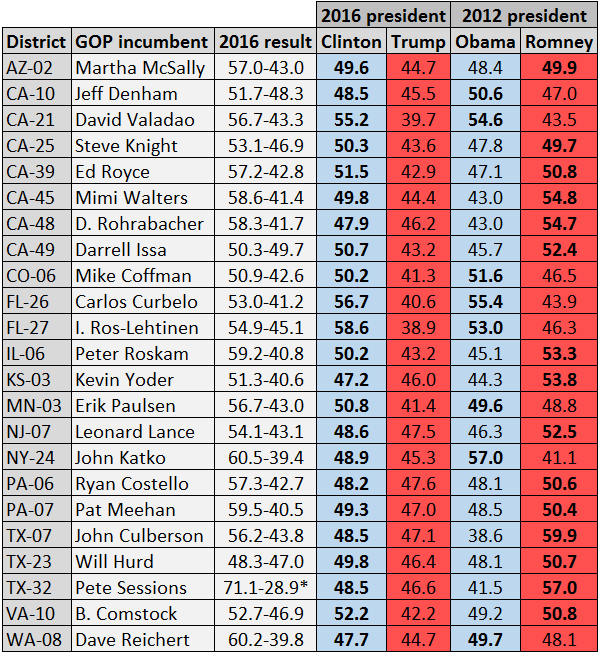 The 12 Democratic districts are mostly seats where Trump significantly improved on Mitt Romney’s 2012 performance. Barack Obama actually carried nine of these 12 seats in 2012, and in some cases by big margins. Several of them had among the biggest declines from Obama 2012 to Clinton 2016, which we measured in last week’s Crystal Ball piece. The districts with the most significant shifts include several of the remaining districts held by Democrats that are either whiter than the average district and/or have fewer college graduates than the average district. Meanwhile, Clinton significantly outran Obama and/or Trump underperformed Romney in many of the 23 Republican districts that Clinton won. Romney actually carried the majority of these districts — 15 of 23 — in 2012, but in many cases they rejected Trump. These districts generally have higher-than-average numbers of college graduates and/or are more diverse than the average district. Setting aside the two incumbents who did not face a major-party opponent — Reps. Ron Kind (D, WI-3) and Pete Sessions (R, TX-32) — the 11 remaining Democrats won, on average, more narrowly than the 22 remaining Republicans. The average margin of victory for the Democrats, excluding Kind, was about six points, while the average margin for the Republicans, excluding Sessions, was about 12 points. However, House performance can vary wildly from election to election, particularly if the overall environment swings one way or the other. As @xenocryptsite, a smart politics observer, recently noted, “The median House member is an R who won by 13. Which sounds safe until you remember 2009 median was D who won by 15.” Republicans, of course, netted 63 seats and the House majority in 2010 just two years after the Democrats had a sterling election in 2008. Minnesota features a quarter of the 12 Democratic crossover seats, and Reps. Tim Walz (D, MN-1), Collin Peterson (D, MN-7), and Rick Nolan (D, MN-8) all won relatively narrow victories. Nolan’s close call was expected — his rematch with Stewart Mills (R) drew an outsized amount of national money and attention after Nolan’s tiny win in 2014 — but Trump’s massive improvement on Romney in all three districts gave all three incumbents headaches. If any of them retire or run for another office — Walz and Nolan are considering running for governor, while Peterson often ponders retirement — any of these seats could be a GOP pickup, and Republicans could heavily fund challengers to the incumbents. The same could be true for Reps. Dave Loebsack (D, IA-2), Cheri Bustos (D, IL-17), Matt Cartwright (D, PA-17), and Ron Kind, whose races were not as close as the Minnesota contests in 2016. Bustos is also reportedly considering a run for governor. The other five seats are perennially competitive but did not move very dramatically at the presidential level. Reps. Carol Shea-Porter (D, NH-1) and Josh Gottheimer (D, NJ-5) defeated damaged Republican incumbents, while Reps. Tom O’Halleran (D, AZ-1), Jacky Rosen (D, NV-3), and Sean Patrick Maloney (D, NY-18) benefited from weak opponents. 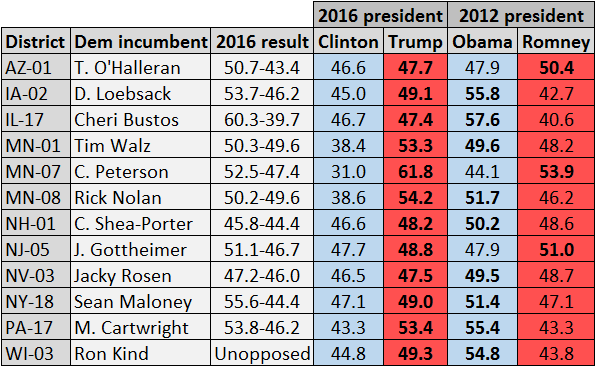 O’Halleran and Maloney posted decent-sized victories in 2016, while Rosen only won by a little more than a point. In all likelihood at least some of these districts will be competitive and expensive. However, without Trump on the ballot, and with generic midterm forces that generally (not always) work in favor of the party that doesn’t hold the White House, the environment for all of these Democratic incumbents may be better in 2018 than it was in 2016. Democrats are hoping that the midterm forces will break against the Republicans instead, which could put many of the 23 Clinton-Republican seats in play. In order to take the House, Democrats will have to win at least one seat that Trump carried (and almost certainly more), given that they need to net 24 seats to get to a majority and there are only 23 crossover districts for them to target. But any Democratic battle plan has to start with these districts. So long as the incumbents run for reelection, several of these districts are held by some of the GOP’s most skilled incumbents who ran well ahead of Trump in their districts, like Reps. Mike Coffman (R, CO-6), Ileana Ros-Lehtinen (R, FL-27), Peter Roskam (R, IL-6), Barbara Comstock (R, VA-10), and Dave Reichert (R, WA-8). A very bad environment could cost any of them their seats, although it’s helpful to Republicans that Ros-Lehtinen, an incumbent who has easily won reelection in every cycle since her initial special election win in 1989, also happens to be the incumbent in the most Democratic-leaning seat any Republican holds. The second-most Democratic seat belongs to Rep. Carlos Curbelo (R, FL-26), another south Florida Republican. The two-term incumbent beat his weak opponent, scandal-tarred former Rep. Joe Garcia (D), by 12 points while Clinton won FL-26 by 16, a 28-point difference in margin. Another two-term member, Rep. John Katko (R, NY-24), has hit 60% of the vote in each of his victories despite occupying a Democratic-leaning upstate seat. That the district got more Republican in 2016 — Clinton only won it by about 3.5 points while Obama won it by 16 — is helpful to the incumbent. The parts of New York not included in New York City’s five boroughs were much friendlier to Trump than to Mitt Romney: The president lost outside his home city by just 66,563 votes, compared to Romney’s 437,029 deficit. This likely gives a boost to other Republicans who occupy some usually swingy districts outside the five boroughs, such as first-term Reps. John Faso (R, NY-19) and Claudia Tenney (R, NY-22), as well as more veteran members like Reps. Lee Zeldin (R, NY-1), Elise Stefanik (R, NY-21), and Tom Reed (R, NY-23). Democrats have held versions of these seats within the last decade — prior to the 2010 GOP wave, Democrats held all but two seats in New York — but as of now the Democrats face uphill battles in all of these seats. Any Democratic House comeback is predicated on squeezing several more seats out of California, where Democrats already hold an impressive 38-14 edge in the delegation (with one vacancy in a heavily Democratic seat). Seven of the 23 Republican crossover seats are in the Golden State. Democrats went hard after Reps. Jeff Denham (R, CA-10), Steve Knight (R, CA-25), and Darrell Issa (R, CA-49) in 2016, but came up short. Issa only won by less than a point, and his Democratic opponent last year, Marine veteran Doug Applegate, is already running again. Issa probably starts 2018 as one of the most endangered House incumbents. Rep. David Valadao (R, CA-21) represents a majority Hispanic seat that Clinton won by 15 points, but Democrats have failed to produce a strong challenger against him (his three election victories have all been by double digits). The other three California seats are mysteries: Reps. Ed Royce (R, CA-39), Mimi Walters (R, CA-45), and Dana Rohrabacher (R, CA-48) all represent parts of Orange County, the one-time conservative enclave that backed Clinton in 2016 (the first time it had gone Democratic since 1936). Are any of them actually vulnerable? It’s hard to say. Rohrabacher and Royce have rarely if ever faced real challenges in their combined more than half century in the House, while Walters has easily won two terms. Still, sometimes, long-term incumbents who haven’t faced real challengers can get caught napping. That contributed to former Rep. John Mica’s (R, FL-7) loss in Florida last cycle, but he also had to run in a district that became more Democratic after mid-decade redistricting. These California incumbents don’t have to deal with redistricting, although if the Clinton-Trump race really represented something of a realignment in a place like Orange County, then these incumbents might effectively be in changed districts even though the district lines haven’t moved. The same mystery applies to Reps. John Culberson (R, TX-7) and Pete Sessions. Was Clinton winning these typically very Republican suburban Houston (Culberson) and Dallas (Sessions) seats just a fluke that has little meaning down the ballot? Or is something more happening? The other Clinton-Republican seat in Texas is clearly more competitive: Rep. Will Hurd (R, TX-23) won a narrow victory, vanquishing ex-Rep. Pete Gallego (D) for a second straight cycle. For the past few cycles, TX-23, which runs from El Paso to San Antonio, has been the only competitive district in the state. Will others, like TX-7 and TX-32, join it? After losing and then winning two of the closest House races in recent memory, Rep. Martha McSally (R, AZ-2) easily won reelection in her swing district, as Democrats effectively gave her a pass by failing to field a strong challenger. Also getting breezy rides to reelection were two Philadelphia-area incumbents, Reps. Ryan Costello (R, PA-6) and Pat Meehan (R, PA-7). They all hold Romney-Clinton districts, and Democrats may try to push them harder in 2018. Democrats thought that Trump could drag down incumbents like Reps. Erik Paulsen (R, MN-3) and Kevin Yoder (R, KS-3), and Trump did badly underperform Romney in each district. But that didn’t prevent either incumbent from posting double-digit wins. Finally, in recent years, Rep. Leonard Lance (R, NJ-7) has had more to worry about in primaries, where opponents have ran against him from the right, than in general elections, although his initial election in 2008 was a nationally-watched contest. So much of what happens next year in the House will be determined by the national environment. But Republicans can take heart that as they go into a midterm under a Republican president, they are not nearly as overextended in the House as Democrats were going into 2010. In that election, Democrats were defending 48 seats that John McCain carried in 2008, and they ended up losing the House. Republicans today are only about half as overextended, and it’s an open question as to whether Democrats can legitimately contend for many of these Clinton-Republican seats. And Republicans should have at least a few appealing targets of their own, such as some of the Trump-Democratic districts. Then again, going into the 2006 midterm, Democrats were defending 40 seats that George W. Bush won two years earlier, while Republicans were only defending 18 seats that John Kerry had won in 2004. So the Democrats were overextended based on the previous presidential results in these districts, but it didn’t stop them from taking control of the House. The national environment was very poor for Republicans in 2006, although Democrats also did an excellent job of tailoring their candidates to moderate and conservative districts, an effort led by former Democratic Congressional Campaign Committee Chairman Rahm Emanuel. But back then the Democrats also controlled many districts in places like the Deep South, Appalachia, and other places where the party is now on life support. Even before the Democrats won the House in 2006, they controlled the at-large seats in both of the Dakotas and a majority of seats in Arkansas, Tennessee, and West Virginia. These are places that don’t seem nearly as open to electing House Democrats as they used to be. This is why Democrats likely need to turn Trump’s weakness in Sun Belt suburbs against the Republican incumbents in those places, because some of the conservative districts Democrats used to represent are likely places where even a weakened Trump will remain quite popular. History is on the Democrats’ side: The president’s party has lost ground in the House in 36 of 39 midterms since the Civil War. The average loss is 33 seats, a shift in seats that would flip the House next year. Unpopular presidents can galvanize the opposition — and Democrats already seem highly engaged in battling Trump — and President Trump’s approval rating is already underwater in some polls, meaning he hasn’t had much of a honeymoon. Of course, there’s plenty of time for that to change, both positively and negatively for the president. There is also a doomsday scenario for Democrats — well, two doomsday scenarios, actually. The first is that Trump rebounds and is popular during the midterm, leading to a rare instance where the president’s party actually gains seats in the House or only suffers minimal losses. The other is that Trump is unpopular and the Democrats still can’t make big gains because, for various reasons, they don’t make big enough inroads in targeted districts. The party may be too socially liberal to recapture the ground it lost in the heartland during the Obama years and too economically liberal to win seats in the affluent, educated suburbs, places that don’t like Trump but are used to sending Republicans to the House with regularity. This is why Democratic recruitment is so important: One size does not fit all in the House, although an optimal national environment can paper over candidate problems, at least for a cycle or two. The Republicans also have structural advantages in the House in part due to Republican control of redistricting after the 2010 census in many states: that both Trump and Romney won a clear majority of House districts despite receiving fewer votes nationally than their Democratic opponents is evidence enough of that GOP edge. In other words, anything’s possible in the House next year. The Republicans have several built-in advantages, but there’s a path for Democrats if they can put many of the seats mentioned above — and others — in play.